Animated map exhibiting the world's oceanic waters. A continuous body of water encircling the Earth, the world (global) ocean is divided into a number of principal areas. 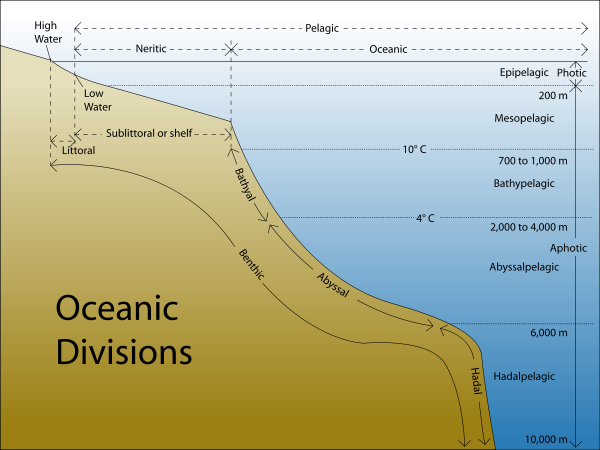 Five oceanic divisions are usually reckoned: Pacific, Atlantic, Indian, Arctic, and Southern; the last two listed are sometimes consolidated into the first three. An ocean (from Ωκεανός, Okeanos (Oceanus) in Greek) is a major body of saline water, and a principal component of the hydrosphere. Approximately 70 percent of the Earth's surface (an area of some 361 million square kilometers (139 million square miles) is covered by saline water forming one continuous body that is customarily divided into several principal oceans and smaller seas. More than half of this area is over 3,000 meters (9,800 ft) deep. Average oceanic salinity is around 35 parts per thousand (ppt) (3.5 percent), and nearly all seawater has a salinity in the range of 31 to 38 parts per thousand with salinity varying according to such factors as precipitation, evaporation, melting of sea ice, and river inflow. The world ocean, an integral part of global climate, is constantly changing, absorbing heat from the sun and cooling through evaporation, dissolving and releasing carbon dioxide, and moving in great conveyor belt currents transferring heat and moisture toward the poles from the tropics and deep below the surface returning cold water to the tropics. From ocean breezes to monsoons, hurricanes, summer rains, and winter fog, the oceans' heat and water vapor are constantly affecting life on land, even far from the ocean shore. The plants and animals living in the world ocean provide human beings with a vast food resource that has tragically been threatened by overexploitation and pollution caused by human activity. Establishing proper use of the ocean will require international cooperation and coordination aligned with the values of co-existence with nature and mutual prosperity for all humankind. As the place where national sovereignties interface with internationally sovereign waters, and where many aquatic species freely traverse the boundaries between the two, the world ocean is a critically important arena in which to resolve issues that have heretofore hindered progress toward a global peace. The World Ocean is one global, interconnected body of salt water comprising the world's five oceans – Atlantic, Pacific, Indian, Arctic, and Southern oceans. The concept of a global ocean as a continuous body of water with relatively free interchange among its parts is of fundamental importance to oceanography. Major oceanic divisions are defined by various criteria, including the shores of continents and various archipelagos. These divisions are (in descending order of size) the Pacific Ocean, the Atlantic Ocean, the Indian Ocean, the Southern Ocean (which is sometimes subsumed as the southern portions of the Pacific, Atlantic, and Indian Oceans), and the Arctic Ocean (which is sometimes considered a sea of the Atlantic). The Pacific and Atlantic may be further subdivided by the equator into northerly and southerly portions. Smaller regions of the oceans are called seas, gulfs, bays, and so forth. In addition, there are some smaller bodies of saltwater that are totally landlocked and not interconnected with the World Ocean, such as the Caspian Sea, the Aral Sea, and the Great Salt Lake. Although some of them are referred to as "seas," they are actually salt lakes. Geologically, an ocean is an area of oceanic crust covered by water. Oceanic crust is the thin layer of solidified volcanic basalt that covers the Earth's mantle where there are no continents. From this perspective, there are three oceans today: the World Ocean and two seas, the Caspian and the Black Sea, the latter two of which were formed by the collision of the Cimmerian plate with Laurasia. The Mediterranean Sea is very nearly a discrete ocean, being connected to the World Ocean only through the eight-mile-wide Strait of Gibraltar, which several times over the last few million years has been closed off completely due to tectonic movement of the African continent. The Black Sea is connected to the Mediterranean through the Bosporus, but this is in effect a natural canal cut through continental rock some 7,000 years ago, rather than a piece of oceanic sea floor like that underlying the Strait of Gibraltar. The area of the World Ocean is approximately 361 million square kilometers (139 million sq mi); its volume is approximately 1,300 million cubic kilometers (310 million cu mi); and its average depth is 3,790 meters (12,430 ft). Nearly half of the world's marine waters are over 3,000 meters (9,800 ft) deep. The vast expanses of deep ocean (depths over 200 m) cover more than half of the Earth's surface. The total mass of the hydrosphere is about 1.4 × 1021 kilograms, which is about 0.023 percent of the Earth's total mass. Less than 2 percent is freshwater, the rest is saltwater, mostly in the ocean. A common misconception is that the oceans are blue primarily because the sky is blue. In fact, water has a very slight blue color that can only be seen in large volumes. Although the sky's reflection does contribute to the blue appearance of the surface, it is not the primary cause. The primary cause is the absorption of red photons from the incoming light by the nuclei of water molecules. The absorption by the nuclei is an anomaly because it occurs through a vibrational change, whereas all other known examples of color in nature result from electronic dynamics. Early exploration of the oceans was limited to its surfaces, associated wind and water currents, and the few creatures that fishermen brought up in nets. Although travel on the surface of the ocean in boats dates back to prehistoric times, only in modern times has extensive underwater travel become possible. When Louis Antoine de Bougainville and James Cook carried out their explorations in the South Pacific, the seas themselves formed part of the reports. During the late eighteenth and at the beginning of nineteenth century, James Rennell wrote the first scientific textbooks about currents in the Atlantic and Indian oceans. Sir James Clark Ross took the first modern sounding in deep sea in 1840, and Charles Darwin published a paper on reefs and the formation of atolls. The steep slope beyond the continental shelves was not discovered until 1849. 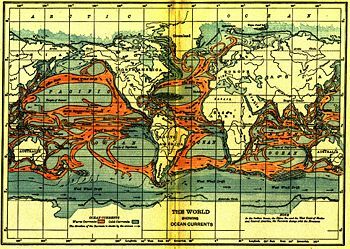 Matthew Fontaine Maury's Physical Geography of the Sea, 1855 was the first textbook of oceanography. The first successful laying of Transatlantic telegraph cable in August 1858 confirmed the presence of an underwater "telegraphic plateau" mid-ocean ridge. After the middle of the nineteenth century, when scientific societies were processing a flood of new terrestrial botanical and zoological information, European natural historians began to recognize the lack of more than anecdotal knowledge of the oceans. In 1871, under the recommendations of the Royal Society of London, the British government sponsored an expedition to explore the world's oceans and conduct scientific investigations. Oceanography became a quantifiable science in 1872, when the Scots Charles Wyville Thompson and Sir John Murray launched the Challenger expedition (1872–1876). Other European and American nations, as well as private individuals and institutions, also sent out scientific expeditions. The four-month 1910 North Atlantic expedition headed by Sir John Murray and Johan Hjort was at that time the most ambitious research oceanographic and marine zoological project ever, and led to the classic 1912 book The Depths of the Ocean. Oceanographic institutes dedicated to the study of oceanography were founded. In the United States, these included the Scripps Institution of Oceanography, Woods Hole Oceanographic Institution, Lamont-Doherty Earth Observatory at Columbia University, and the School of Oceanography at University of Washington. In Britain, there is a major research institution: National Oceanography Centre, Southampton. In Australia, CSIRO Marine and Atmospheric Research, known as CMAR, is a leading center. The first international organization of oceanography was created in 1902 as the International Council for the Exploration of the Sea. In 1921 Monaco formed the International Hydrographic Bureau (IHB). In 1966, the U.S. Congress created a National Council for Marine Resources and Engineering Development. NOAA was in charge of exploring and studying all aspects of Oceanography. It also enabled the National Science Foundation to award funding to multi-disciplinary researchers in the field of oceanography. The deepest point in the ocean, the Marianas Trench located in the Pacific Ocean near the Northern Mariana Islands, with a maximum depth of 10,923 meters (35,838 ft) was fully surveyed in 1951 by the British naval vessel, "Challenger II," which gave its name to the deepest part of the trench, the "Challenger Deep." In 1960, the Trieste successfully reached the bottom of the trench, manned by a crew of two men. Much of the bottom of the world's oceans remains unexplored and unmapped. A global image of many underwater features larger than 10 kilometers (6 mi) was created in 1995 based on gravitational distortions of the nearby sea surface. Modern technology, including surveys conducted with sonar imaging, underwater cameras and unmanned underwater robots and submarines have made possible rapid advances in the mapping of the sea floor. Oceans are divided into numerous regions depending on physical and biological conditions. The pelagic zone, which includes all open ocean regions, is often subdivided into further regions categorized by depth and abundance of light. The photic zone covers the oceans from surface level to 200 meters down. This is the region where photosynthesis occurs most commonly and therefore where the largest biodiversity in the ocean lives. Since plants can only survive through photosynthesis, any life found lower than this must either rely on organic detritus floating down from above (marine snow) or find another primary source such as hydrothermal vents in what is known as the aphotic zone (all depths exceeding 200 m). The pelagic part of the photic zone is known as the epipelagic. The pelagic part of the aphotic zone can be further divided into regions that succeed each other vertically. The mesopelagic is the uppermost region, with its lowermost boundary at a thermocline of 10°C, which, in the tropics generally lies between 700 meters and 1,000 meters (2,297 and 3,280 feet). Directly below that is the bathypelagic lying between 10°C and 4°C, or between 700 or 1,000 meters (2,297 and 3,280 feet) and 2,000 or 4,000 meters (6,560 or 13,123 feet). Lying along the top of the abyssal plain is the abyssal pelagic, whose lower boundary lies at about 6,000 meters (19,685 feet). The final zone falls into the oceanic trenches, and is known as the hadalpelagic. This lies between 6,000 meters and 10,000 meters (19,685 and 32,808 feet) and is the deepest oceanic zone. Along with pelagic aphotic zones there are also seafloor or benthic aphotic zones corresponding to the three deepest zones. The bathyal zone covers the continental slope and the sides of the mid-ocean ridge down to about 4,000m. The abyssal zone covers the abyssal plains between 4,000 and 6,000m. Lastly, the hadal zone corresponds to the hadalpelagic zone which is found in the oceanic trenches. The pelagic zone can also be split into two subregions, the neritic zone and the oceanic zone. The neritic encompasses the water mass directly above the continental shelves, while the oceanic zone includes all the completely open water. In contrast, the littoral zone covers the region between low and high tide and represents the transitional area between marine and terrestrial conditions. It is also known as the intertidal zone because it is the area where tide level affects the conditions of the region. One of the most dramatic forms of weather occurs over the oceans: tropical cyclones (also called hurricanes, typhoons, tropical storms, cyclonic storms, and tropical depressions depending upon where the system forms). A tropical cyclone feeds on the heat released when moist air rises and the water vapor it contains condenses. Tropical cyclones can produce extremely powerful winds and torrential rain, high waves and damaging storm surge. Although their effects on human populations can be devastating, tropical cyclones also relieve drought conditions. They also carry heat and energy away from the tropics and transport it towards temperate latitudes, which makes them an important part of the global atmospheric circulation mechanism. Tropical cyclones help to maintain equilibrium in the Earth's troposphere, and to maintain a relatively stable and warm temperature worldwide. Ocean currents greatly affect Earth's climate by transferring warm or cold air and precipitation to coastal regions, where they may be carried inland by winds. The Antarctic Circumpolar Current encircles that continent, influencing the area's climate and connecting currents in several oceans. Until recently, the ocean appeared to be a vast and infinite source of food, invulnerable to exploitation. In contrast, the reality is that the populations of many species living in the ocean are decreasing rapidly. NOAA has jurisdiction over 157 endangered and threatened marine species, including 63 foreign species. Marine life is vulnerable to problems such as overexploitation, pollution, habitat destruction, and climatic changes. Air-breathing animals such as whales, turtles and manatees are often caught in fishing nets or injured by boats. Species such as birds and turtles that lay their eggs on land lose their nurseries to coastal development, and the spawning grounds of fish are eliminated by alterations to inland waterways such as dams and diversion canals. Pollution from ships, raw sewage, and ground run-off create nutrient overloads in the waters or poison corals and the small organisms that feed larger animals. The oceans are essential to transportation: most of the world's goods are moved by ship between the world's seaports. The Panama and Suez canals allow ships to pass directly from one ocean into another without having to circumnavigate South America and Africa respectively. The oceans are an important source of valuable foodstuffs through the fishing industry. Aquaculture, an expanding industry, achieves increased production of specific species under controlled conditions while also relying heavily on the oceans as a source of feed stock for the farmed fish. During the twentieth century, exploitation of natural resources under the sea began with the drilling of oil wells in the sea bed. During the 1950s, companies began to research the possibility of mining the ocean floor for mineral resources such as diamonds, gold, silver, manganese nodules, gas hydrates and underwater gravel. In 2005, Neptune Resources NL, a mineral exploration company, applied for and was granted 35,000 km² of exploration rights over the Kermadec Arc in New Zealand's Exclusive Economic Zone to explore for seafloor massive sulfide deposits, a potential new source of lead-zinc-copper sulfides formed from modern hydrothermal vent fields. The oceans are also a vital resource for tourism. In every country that has a coastal boundary, beaches are favorite places for relaxation, water sports, and leisure. With the advent of train and air travel, millions of tourists began to visit beaches in countries with warm climates. Many developing nations rely on tourism to their beach resorts as a major element of their economies. Travel on large luxury cruise ships is becoming increasingly popular. Bridge River Ocean, the ocean between the ancient Insular Islands and North America. Iapetus Ocean, the southern hemisphere ocean between Baltica and Avalonia. Panthalassa, the vast world ocean that surrounded the Pangaea supercontinent. Slide Mountain Ocean, the ocean between the ancient Intermontane Islands and North America. Tethys Ocean, the ocean between the ancient continents of Gondwana and Laurasia. Khanty Ocean, the ocean between Baltica and Siberia. Mirovia, the ocean that surrounded the Rodinia supercontinent. Paleo-Tethys Ocean, the ocean between Gondwana and the Hunic terranes. Pan-African Ocean, the ocean that surrounded the Pannotia supercontinent. Superocean, the ocean that surrounds a global supercontinent. Ural Ocean, the ocean between Siberia and Baltica. Earth is the only known planet with liquid water on its surface and is certainly the only one in our Solar System. Astronomers think, however, that liquid water is present beneath the surface of the Galilean moons Europa, and (with less certainty) Callisto and Ganymede. Geysers have been observed on Enceladus, though they may not involve bodies of liquid water. Other icy moons such as Triton may have once had internal oceans that have now frozen. The planets Uranus and Neptune may also possess large oceans of liquid water under their thick atmospheres, though their internal structure is not well understood at this time. There is currently much debate over whether Mars once had an ocean of water in its northern hemisphere, and over what happened to it if it did. Recent findings by the Mars Exploration Rover mission indicate Mars probably had some long-term standing water in at least one location, but its extent is not known. Astronomers believe that Venus had liquid water and perhaps oceans in its very early history. If they existed, all traces of them seem to have vanished in later resurfacing of the planet. Liquid hydrocarbons are thought to be present on the surface of Titan, though it may be more accurate to describe them as "lakes" rather than an "ocean." The Cassini-Huygens space mission initially discovered only what appeared to be dry lakebeds and empty river channels, suggesting that Titan had lost what surface liquids it might have had. Cassini's more recent fly-by of Titan has yielded radar images strongly suggestive of hydrocarbon lakes near the polar regions where it is colder. Scientists also think it likely that Titan has a subterranean water ocean under the mix of ice and hydrocarbons that forms its outer crust. Gliese 581 c, one of the extrasolar planets that has been found in recent years, is at the right distance from its sun for liquid water to exist on the planet's surface. Since the alignment of Gliese 581 c's orbit in relation to the viewing angle from earth precludes a visible transit by the planet of its sun, there is no way to know if the planet does have liquid water. Some researchers have suggested that the extrasolar planet HD 209458b may have water vapor in its atmosphere, but this view is currently being disputed. The extrasolar planet Gliese 436 b is believed to have 'hot ice', i.e., ice existing under conditions of greater gravity than on earth and hence with a higher melting temperature than on earth. If water molecules exist on either HD 209458b or Gliese 436 b, they are likely to be found also on other planets at a suitable temperature, meaning that there would be some further reason to hope someday to find another planet besides Earth with water ocean. all the fountains of the great deep [were] broken up, and the windows of heaven were opened, inundating the world with the waters of the celestial ocean. ↑ Athelstan F. Spilhaus, "Maps of the whole world ocean," Geographical Review 32(3) (1942): 431-35. Retrieved August 21, 2017. ↑ Glenn Elert, "Volume of Earth's Oceans" hypertextbook.com. Retrieved August 21, 2017. ↑ William J. Beaty, Recurring Science Misconceptions in K-6 Textbooks. amasci.com. Retrieved August 21, 2017. ↑ C. L. Braun and S. N. Smirnov, "Why is Water Blue?" J. Chem. Edu. 70(8)(1993): 612. Retrieved August 21, 2017. ↑ Sea Grant College. factbites.com. Retrieved August 21, 2017. ↑ Deep Ocean Studies, Ocean Studies. Retrieved August 21, 2017. ↑ Endangered and Threatened Marine Species, NOAA Fisheries. Retrieved August 21, 2017. ↑ David Shiga, Strange alien world made of ‘hot ice’. New Scientist May 16, 2007. Retrieved August 21, 2017. All links retrieved December 17, 2018. Ocean World. Texas A&M University. NOAA’s National Ocean Service, NOC (National Ocean Service) at NOAA (National Oceanic and Atmospheric Administration. Ocean Facts and Activities for kids. This page was last modified on 17 December 2018, at 17:04.